Kirigami comes from the Japanese words "kiru" (to cut) and "kami" (paper). It is similar to origami because some folding is involved, but different because the primary method of creating a design is the skillful cutting of the paper. In the United States, the term kirigami was introduced to paper crafters by Florence Temko in 1962. The practice was described in detail in her book Kirigami, the Creative Art of Papercutting. Symmetry is a very important part of kirigami. When the paper is folded before it is cut, the resulting design is the same on both sides. Simple kirigami projects may consist of four-fold symmetry created by folding the paper in half horizontally, then folding it half vertically. At the other end of the spectrum, 12-fold symmetry can be created by folding the paper in half, then folding it into thirds, and then folding it in half again. Most kirigami patterns have solid lines to indicate where to cut and shaded areas to show what portion of the paper will be removed when you are done. Dashed lines normally indicate mountain folds or valley folds. Kirigami can technically be done with any type of paper, although thinner paper is a must for projects that involve lots of folding. For pop-up cards, several crafters recommend using watercolor paper because the subtle texture adds interest to the design. For some people, a craft knife is easier to use than scissors when working on a kirigami project. Use a knife with a sharp blade and invest in a self-healing mat to avoid damaging your work surface. Other helpful supplies for experimenting with kirigami include an awl or ruler for creating sharp creases in the paper, double-sided tape, and a glue stick with an adhesive that dries clear. Learning how to use scissors correctly helps develop a child's fine motor skills. Completing simple kirigami projects is a good way for kids to practice cutting. Scissor Craft has several printable kirigami projects for young children. Making paper doll chains or paper snowflakes is also a form of kirigami. 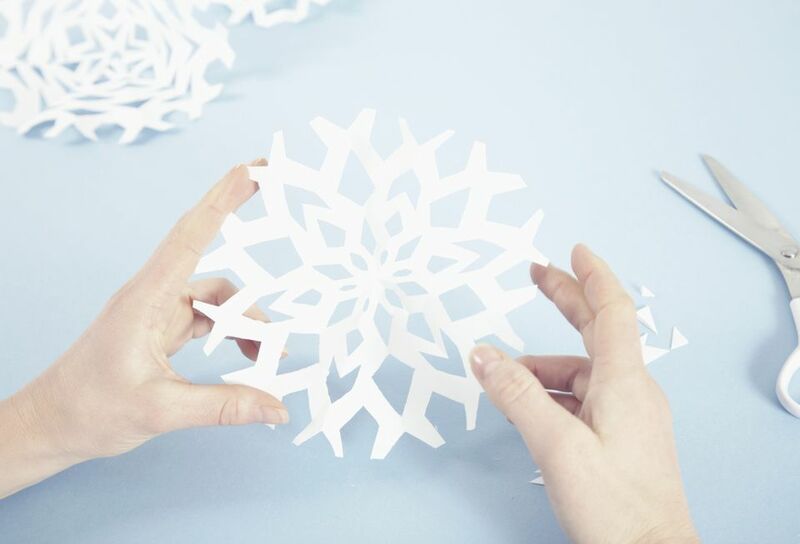 Check out PaperSnowflakes.com for a selection of unique snowflake cutting patterns. One very popular example of kirigami is the pop-up greeting card. By artfully folding and cutting the paper before gluing it to a colored background, you can make an image such as a teddy bear or a bouquet of flowers appear to pop-up from the page when the card is opened. Maria Victoria Garrido offers several free printable kirigami patterns on her website. Easy Cut Pop-Up is an excellent resource for video tutorials and general kirigami tips, as well as patterns that you can purchase. Pop-Up Card Making is an Etsy shop that sells a variety of interesting Kirigami card patterns. One of the most interesting offerings is a set of patterns with a "12 Days of Christmas" theme. You make 12 cards to send to a friend or family member, then create a book that they can use to store them all in. Online kirigami patterns are convenient, but paying for individual patterns is not cost effective for crafters who are seriously interested in kirigami. If you're planning to make more than one or two pop-up cards, consider investing in a copy of Simply Precious Pop-Ups by Kiyoshi Kikuchi. This book offers over 50 different pop-up card patterns for birthdays, holidays, and special occasions like weddings or anniversaries. Photos of completed cards are compiled in a gallery at the beginning of the book, which serves as an inspirational introduction to the art of pop-up card making. Even though the finished cards are quite beautiful, most patterns should be suitable for teenagers or adult beginners to complete.